Here at Hawaiian Island Weddings we are always striving to offer new wedding packages to our couples. Today we have introduced a new wedding & honeymoon package, this time on the island of Hawaii. The newly renovated Waikoloa Marriott Resort offers spatucular views of the Kohala Coast and is situated on Anaehomalu Bay, probably the most beautiful bay on the Big Island. The resort has just completed their 50 million dollar restoration and everything has been improved, all the guest rooms have been redone with lush fabrics and new furniture, the lobby has been redesigned, and a new ball room has been completed. 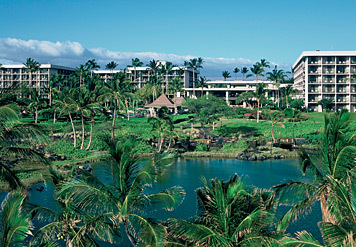 Our new Ocean Front Waikoloa Wedding & Honeymoon package offers the best that the island of Hawaii can offer. Bring your guests since your wedding takes place on Waikoloa Beach, just in front of the hotel. This is the same spot King Kamahamaha walked in ancient times, his fish pond (adjacent to the hotel) is the largest built by the Hawaiian people. We have pulled out all the stops for this one.. eight nights accommodations, convertible rental car, daily buffet breakfast for the two of you, and even a chilled bottle of Champagne upon your arrival. See all the details and enjoy the best of Hawaii!